People with COPD can have a range of symptoms, including cough, wheeze, sputum production and breathlessness. Many people mistake their increased breathlessness and coughing as a normal part of aging. 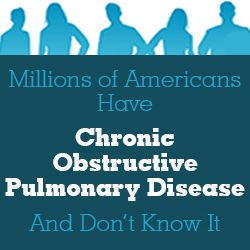 COPD affects over 24 million Americans. The National Heart, Lung and Blood Institute estimates that 12 million adults have COPD and another 12 million are undiagnosed or developing COPD. COPD is the third leading cause of death in the United States, killing more women than men each year. Every four minutes an individual dies of COPD. A physician diagnoses COPD based on signs and symptoms, an assessment of smoking habits and/or contact with lung irritants, medical and family histories, and lung function tests, including spirometry, a painless test that involves blowing into a tube connected to a small machine. Bronchodilator Reversibility is also performed once on a patient in order to exclude asthma and to establish the best lung function for the individual patient. In addition, a chest radiography can help eliminate the possibility of other diseases, such as pneumonia, cancer and congestive heart failure. Cigarette smoking is the main cause of COPD (75 percent of all COPD-related deaths are attributable to cigarette smoking), although air pollution and occupational dusts are also common causes of the disease. About two to three percent of individuals have a genetic form of COPD called Alpha-1 Antitrypsin (ATT) Deficiency. There are treatments available that can improve a patient’s quality of life, such as medication, vaccination, pulmonary rehabilitation, oxygen therapy and surgery. These therapies are used to help the patient relieve symptoms, reduce the frequency and severity of exacerbations, and improve overall health and ability to exercise. For those who have trouble quitting, they should talk with their doctor about programs and products that can help, and consider joining a support group. Many hospitals, workplaces, and community groups offer classes to help people quit smoking. It’s also important to avoid secondhand smoke and places with dust, fumes, or other toxic substances that can be inhaled. Proper diet is also important for those living with COPD, and should involve eating smaller, more frequent meals, resting before eating and taking vitamins or nutritional supplements. Depending on the severity of the disease, the doctor may prescribe short-acting or long-acting bronchodilators. Short-acting bronchodilators last about 4–6 hours and should be used only when needed. Long-acting bronchodilators last about 12 hours or more and are used every day. The use of bronchodilators relaxes the muscles around the airways, opening airways and making it easier to breathe. Comprehensive pulmonary rehabilitation, including exercise, strength training, multiple education components, effective COPD self-management, and nutritional advice, have all been shown to improve quality of life and to reduce exacerbations and hospitalizations in individuals with COPD. For optimal management of COPD, a combination of these strategies and a multidisciplinary team approach involving physicians, respiratory therapists, nurses and other healthcare professionals is essential. Lung damage from COPD is irreversible, and the quality of life for a person suffering from COPD diminishes as the disease progresses. While COPD is currently incurable, it is still treatable. Individuals of every race and culture should take steps to help maintain a good quality of life by contacting a physician to determine a diagnosis, learn more about the disease and develop the best strategies for care. [i] Anthonisen NR, Connett JE, Kiley JP. Et al. Effects of smoking intervention and the use of an inhaled anticholinergic bronchodilator on the rate of decline of FEV1. The Lung Health Study. JAMA 1994. 2721497-1505.